Sawatdee Kha! So you're engaged...congratulations! One of the most fun parts about getting married is the planning that you could enjoy the honeymoon trip of a lifetime. And if you haven't even narrowed it down to a country, much less an island or a resort, or an exotic destination, don't worry-many (if not most!) honeymoon couples are in the same boat. The world's most romantic hideaways are waiting in Thailand. Discover our luxury honeymoon options that encompass the stunning scenic and cultural delights of this unique country. Thailand has a natural asset in breath taking scenery, featuring spectacular green mountains, white sandy beaches, and sparking blue sea. Combine that with our world class range of sophisticated accommodation options, elegant dining and variety of activites and you will experience Thailand at its greatest. The Honeymoon has custom designed many honeymoon packages that have produced rich experiences for the honeymoon clientele for whom these packages were created. These custom honeymoon packages include many unique features, carefully chosen hotels and provide the best value to make your honeymoon both memorable and affordable. It is our pleasure to bring these packages to you with the hope that you find one that makes your honeymoon what it should be - the trip of a lifetime! Thailand more than any other destination in Asia offers the discerning traveller not only value for money but a simply breathtaking array of stunning hotels to choose from. Let Turquoise guide your choices and design the perfect Thailand honeymoon, combining the very best of the countries romance, excitement, relaxation and adventure. 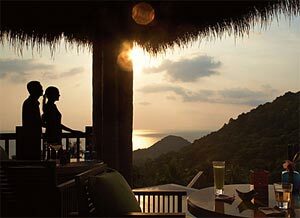 Thailand is a magical place perfect for a romantic honeymoon getaway. Whether you seek seclusion on a pristine tropical island or the excitement of experiencing a new culture, Thailand has something for everyone. Dreamy palm-fringed shores, verdant rain forests, and the welcoming native population are just a few of the reasons why the Land of Smiles has secured a reputation as a world-class honeymoon destination. Thailand’s unique geography, with mountains in the cool north, and steamy beaches in the sandy south, allows visitors to custom tailor honeymoons. Five-star luxury in Thailand is also significantly less expensive than in the west, which is great for newlyweds that want an exotic honeymoon on a budget. Thailand is the perfect place for romantic excursions that offer visitors an unlimited variety of life changing experiences. A Thailand honeymoon might be just what your relationship needs.